So, know how I've been saying I've been feeling a bit off. I was actually worried I was getting sick. My friend, Denise, woke up Friday morning with a sore throat and was kind of cruddy the rest of the weekend. This morning...sore throat. I'm hoping its just allergies and that the outdoor run with all the pollen is the main cause of the sinus drainage, which is creating the sore throat. I've taken Zyrtec and tons of vitamin C, and even bought a bag of Halls. And, like anyone denying being sick, I hit up spin class today. [begin rant] I must say, maybe it was partially knowing that I was sick and partially because this chick did basically the same thing last week...but why on earth waste time going to a class if you're not going to put all you have into it? Last week she spent most of the class (up until she left early) off her bike adjusting the seat. This week, she stuck it out, but still spent most of the time adjusting her seat. I was so proud of myself for preparing last night's dinner on Tuesday night. So, I thought I'd get started last night on tonight's meal. What I hadn't thought about was that it is Cinco de Mayo today. After seeing all the blog posts of yummy looking salsas, tacos, and more, now I'm sorry I was so Johnny on the spot starting dinner ahead of time. Oh well. Last night I started pressing tofu. 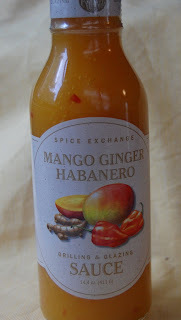 This morning I started marinating it in the Mango Ginger Habanero sauce (sorry, still can't find a proper link to the product). I still have. I cut it with some OJ and whisked it together. It's gorgeous, and that calls for grilling. I thought a Grilled Veggie and Tofu Salad sounded perfect. I grilled up the marinated tofu, squash, zucchini, sweet potato, and bell peppers. What transpired was a Roasted Veggie & Tofu Salad instead. Jason had to pick up the pups from a big day at the vet and groomer. I wasn't sure when he'd be home, so roasting the veggies in the oven seemed like an easier option so that I could better monitor when they would be done.